After 1998, the real estate market in China experienced many rounds of policy regulations in the following years. However, the effect on the price of residential housing is not obvious. Hence, Shanghai as a pilot introduced property tax on the residential houses. 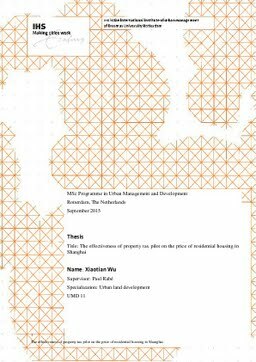 This research focuses on the effectiveness of property tax pilot on the residential housing in Shanghai. The main goal of this research is to analyse the influence of property tax pilots to see whether it can restrain the growing price of residential housing or just a value capture instrument to obtain the revenue. In this study, a combination of quantitative and qualitative research is conducted. In detail, a hedonic model and in-depth interviews are applied. It is found that the property has negative effect the housing price by decreasing the demand and increasing the supply. Besides, the property tax can be used as effective long-term tools for restrain the growing housing price. And it is a stable income to provide social housing to low-income people. At last, some advices are given. The study suggested that at least 5 years data or more are needed. And some important factors like population, employment and consumption should be included in the model and interviews. In addition, more samples are necessary for the in-depth interview.